Explore the high Atlas Mountains, visit the Kasbah of Toubkal and the village of Asni, the day tour from Marrakech to imlil begins at 9AM from Marrakech to Asni, in the valley of Imlil, and the high Atlas. 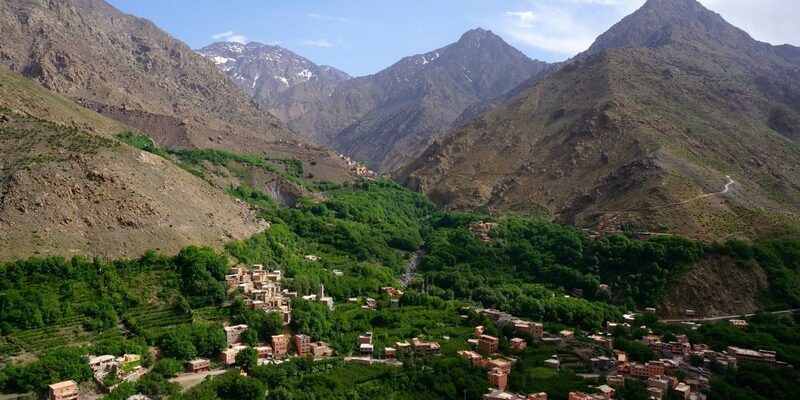 The private day trip to explore the high Atlas Mountains, visit the Kasbah of Toubkal and the village of Asni, the day tour from Marrakech to imlil begins at 9AM from Marrakech to Asni, in the valley of Imlil, and the high Atlas. We will drive along the village of Tahnnaout with many stops for breathtaking photos of the berber villages settled in the foothills of the mountains and the rivers. If it’s Thursday we will have the chance to visit the weekly berber market at the village of Asni and the small village of Tahanaout where the farmers of the region meet twice a week in berber market (Tuesday and Saturday). After an hour we will be at the foot of Toubkal, the highest mountain in Morocco and northern Africa (more than 4167 meters). Once in Imlil you will meet a local guide who will take you in an explorative hiking tour to discover the hidden berber villages in High Atlas. After the hiking you will stop in the famous Kasbah of Toubkal for a delicious lunch on a panoramic terrace with beautiful views over the villages. In the afternoon we will drive back to Marakech through the valleys of happiness. “End of Full private day trip to imlil kasbah and asni village from marrakech”.